EVERYONE SHAMPOO, VOLUME IS NEVER TESTED ON ANIMALS. THIS PRODUCT IS MADE WITH PLANT EXTRACTS AND PURE ESSENTIAL OILS AND IS FORMULATED TO BE GENTLE YET EFFECTIVE WITHOUT SULFATES, PARABENS OR PHTHALATES. EVERYONE SHAMPOO, VOLUME IS INFUSED WITH QUINOA PROTEIN, LEAVING YOUR HAIR LOOKING BOUNCY AND BOLD WHILE ROSEMARY AND MINT MAKES HAIR VISIBLY SHINIER AND HEALTHIER. EVERYONE SHAMPOO, VOLUME IS SULFATE FREE FOR ALL HAIR TYPES. 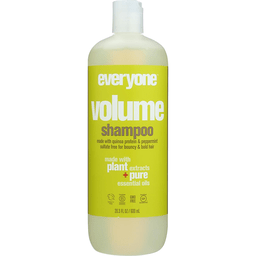 EACH RECYCLABLE BOTTLE OF EVERYONE SHAMPOO, VOLUME CONTAINS 20.3 FL. OZ. OF PRODUCT. EVERYONE CONDITIONER, BALANCE IS NEVER TESTED ON ANIMALS. THIS PRODUCT IS MADE WITH PLANT EXTRACTS AND PURE ESSENTIAL OILS AND IS FORMULATED TO BE GENTLE YET EFFECTIVE WITHOUT SULFATES, PARABENS OR PHTHALATES. EVERYONE CONDITIONER, BALANCE IS INFUSED WITH TEA TREE AND CITRUS TO BRING YOUR SCALP AND HAIR BACK TO THAT SWEET SPOT WHILE QUINOA PROTEIN AND ABYSSINIAN OIL LEAVES HAIR LOOKING SMOOTHER AND SHINIER. 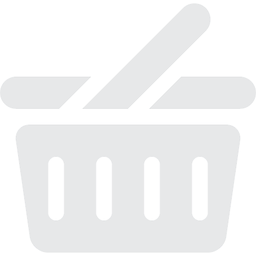 THIS PRODUCT IS SULFATE FREE FOR ALL HAIR TYPES AND SAFE FOR COLOR TREATED HAIR. 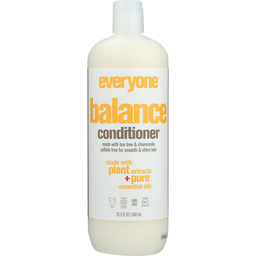 EACH RECYCLABLE BOTTLE OF EVERYONE CONDITIONER, BALANCE CONTAINS 20.3 FL. OZ. OF PRODUCT. EVERYONE CONDITIONER, NOURISH IS NEVER TESTED ON ANIMALS. THIS PRODUCT IS MADE WITH PLANT EXTRACTS AND PURE ESSENTIAL OILS AND IS FORMULATED TO BE GENTLE YET EFFECTIVE WITHOUT SULFATES, PARABENS OR PHTHALATES. EVERYONE CONDITION, NOURISH IS INFUSED WITH ALOE AND QUINOA PROTEIN TO HELP YOUR HAIR LOOK ITS BEST WHILE COCONUT AND ABYSSINIAN OILS NOURISH DRY, DAMAGED, AND COLOR TREATED HAIR. THIS PRODUCT IS SULFATE FREE FOR ALL HAIR TYPES. 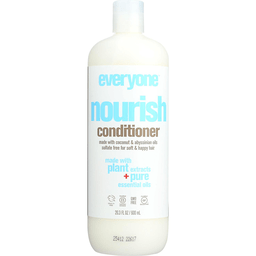 EACH RECYCLABLE BOTTLE OF EVERYONE CONDITIONER, NOURISH CONTAINS 20.3 FL. OZ. OF PRODUCT.